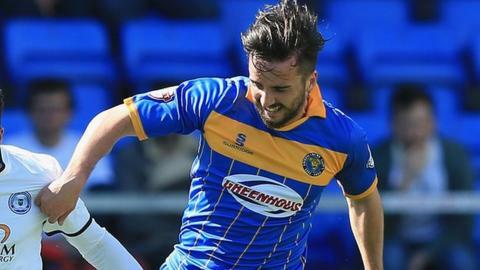 Shrewsbury Town midfielder Aaron Wildig and defenders Jermaine Grandison and Ryan Woods have all signed new deals with the relegated League One club. Grandison, 23, has signed an extension to his existing contract to tie him to the Meadow for at least another year. Wildig, 22, and Woods, 20, have both made a sufficient number of starts this season, to trigger an extra year. The club have also offered new deals to striker Tom Bradshaw, 21, and young defender Connor Goldson, 21. The confirmation that Wildig, Woods and Grandison will stay significantly bolsters a squad which had just seven contracted players when new boss Micky Mellon took over on Monday. Hereford-born former Wales Under-16 international Wildig initially arrived on loan from Cardiff City in November 2011, completing his move to the Meadow at the end of that season following Town's promotion to League One. Tamika Mkandawire, Dave Winfield, Dave McAllister, Dom Smith, Callum Burton, Harry Lewis, Jon Taylor, Aaron Wildig, Jermaine Grandison, Ryan Woods. After signing a one-year contract extension last summer, he made 33 appearances this season. But his two absences though injury proved a key factor in Town's decline from lower mid-table under Graham Turner before Christmas, to relegation candidates from the turn of the year onwards. They won just once in six games after Wildig suffered a knee injury in the 1-0 win over Notts County in late November. And, after suffering a thigh injury in January, he was then out for a further two months, during which time Turner stepped down, Mike Jackson took over - and Town won just once in 11 matches. "I'm very pleased to still be part of the club next year," Wildig told BBC Radio Shropshire. "It was disappointing to be relegated, but it was the best season I've had in terms of personal performances. I played the most I've had and I hope to kick on." Grandison, signed from Coventry City in January 2011, was also part of the squad which gained promotion from League Two the following year. But a persistent hip problem, which initially led to him declining his contract offer last summer, has limited the Birmingham-born defender to just seven starts since January 2013. "I'm just looking forward to next season now and getting back to how I was playing before my injury," said Grandison. "It wasn't the best of seasons for us but now we've got to look forward." Woods, who came through the ranks at the Meadow, said: "On a personal level, I had a very good season. But it was all about keeping Shrewsbury in League One and unfortunately we didn't manage to do that. "We've just got to look to bounce back now. I learnt a lot over the season and probably experienced just about everything you can."